A New York investment firm, Neuberger Berman, which includes Steve Eisman ("The Big Short") as one of their portfolio managers, has significantly expanded their bank shorts and most notably added Barclays as their third UK bank short. As of the latest disclosures, three UK bank shorts are reported: Barclays (219 500 shares short), Lloyds (586 900 shares short) and RBS (167 250 shares short). RBS and Lloyds have already been reported in the past, while Barclays is a new addition to the fund's short portoflio vs previous disclosure. Note that Steve Eisman recently mentioned that he broadened his short bets to a third unnamed UK bank (ref. Bloomberg). 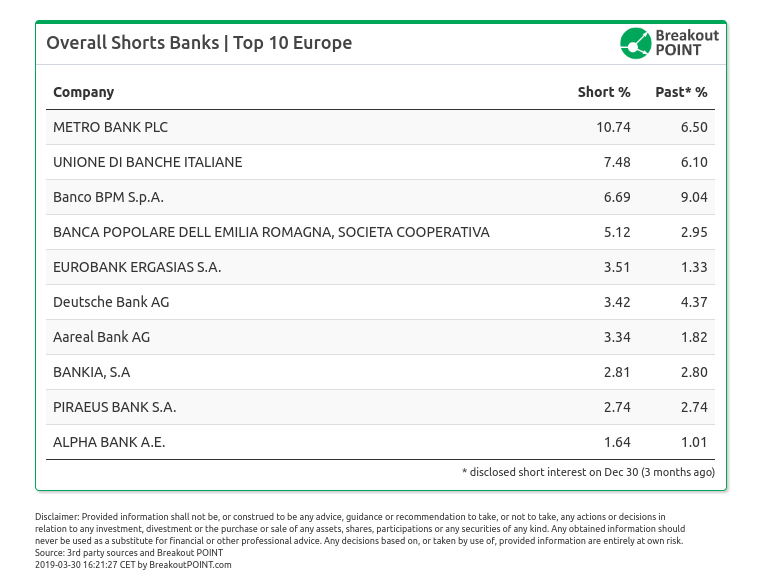 Beyond three UK shorts, four more EU banks are shorted by the fund. These are: BBVA (Spain), UniCredit (Italy), Societe Generale (France) and Svenska Handelsbanken (Sweden). All of them have already been disclosed in the past. Steve Eisman mentioned in July 2018 that BBVA and UniCredit shorts are due to exposure to Turkey (ref. Bloomberg). Both shorts were, so far, very successful: BBVA and UniCredit shorts popped-up in disclosures as of 2019-07-31 (BBVA down about 19% since) and 2019-04-30 (UniCredit down about 36% since), respectively. The fund also holds several short positions in Canada's banks: Canadian Imperial Bank of Commerce, Laurentian Bank of Canada and Royal Bank of Canada. These three shorts also appeared in previous disclosures. Furthermore, and associated with the equity swaps, the fund holds a short position in National Bank of Canada. As recently reported in Financial Times, Steve Eisman added to the short bets against Canadian banks, but did not name the banks he is shorting (ref. FT). US bank shorts include three positions, with Wells Fargo being, by far, the largest of the three. It is notable that, with exception of Wells Fargo and National Bank of Canada, all of the above shorts have been significantly increased versus previous disclosure. The fund has increased their overall bank short position from about $3.3m (1.4%) to about $5m (2.3%). About 30% of this amount is, each, in bets against UK and Canadian banks, while about 35% is in four EU (non-UK) bets. Neuberger Berman’s Absolute Return Multi-Manager Fund reportedly contains investments of Eisman (ref. Mail on Sunday). The bank short positions that we presented in this note are from that fund. Don't want to miss the latest short bets by influential investors and activists? Join Breakout POINT. Note: This post was updated with media mentions, more details on BBVA and UniCredit, as well as with details on the big shorts by hedge funds in EU banks.